Ethan has been on my radar for a number of years now for creating minimal logos and graphics that reflect classic mid-century design aesthetics. On today's show we discuss how creating passion/personal projects can help you land your dream client, the benefits of looking back into the past for inspiration and how to stay enthusiastic about designing when your job is also in a creative field. Find Ethan and all his projects here: Ethan on Instagram Courier Design Instagram Courier Design Website Thank you for listening to this episode of The Fowler Hour! Don't forget to subscribe to the show and share it on twitter and instagram! Your support, tweets and mentions help us reach new listeners just like you! Tweet about the show by using #fowlerhour Tag me in your instagram stories @cfowlerdesign This show is supported in part by our awesome sponsors! Never stop learning! Get 2 FREE months of Skillshare and take your design skills to the next level! https://skl.sh/cfowlerdesign Upgrade your font library, design assets and textures with Design Cuts! Check out their latest bundle and potentially save $1000s! https://cfowler.design All of these links are affiliate based, so by checking out our sponsors you help to support this show and keep it going! Thank you! Arun and I met through the Futur Young Guns series over a year ago and on today's episode we discuss productivity, getting your first agency job and how to work with and get over scarcity mindset. This episode is jammed full of value and I know you will walk away from this hour with a new perspective on what you can achieve in 2019! Find Arun and all his projects here: Scientist X Designs Instagram Scientist X Designs Twitter Scientist X Website Thank you for listening to this episode of The Fowler Hour! Don't forget to subscribe to the show and share it on twitter and instagram! Your support, tweets and mentions help us reach new listeners just like you! Tweet about the show by using #fowlerhour Tag me in your instagram stories @cfowlerdesign This show is supported in part by our awesome sponsors! Never stop learning! Get 2 FREE months of Skillshare and take your design skills to the next level! https://skl.sh/cfowlerdesign Upgrade your font library, design assets and textures with Design Cuts! Check out their latest bundle and potentially save $1000s! (LIMITED TIME OFFER) https://cfowler.design All of these links are affiliate based, so by checking out our sponsors you help to support this show and keep it going! Thank you! Austin first caught my attention during the Logo Hunt contest over a year ago, with his incredible series of submissions. So, I thought it was about time to get him on the podcast! On today's show we discuss the benefits of exploring creative styles beyond your niche, avoiding burnout and how to build a long successful career. A killer episode that I think will resonate with you for a long time to come! Find Austin and all his projects here: Austin's Website Austin on Instagram Thank you for listening to this episode of The Fowler Hour! Subscribe to the show and share it on twitter and instagram! Your support, tweets and mentions help us reach new listeners just like you! Tweet about the show by using #fowlerhour Tag me in your instagram stories @cfowlerdesign This show is supported in part by our awesome sponsors! Never stop learning! Get 2 FREE months of Skillshare and take your design skills to the next level! https://skl.sh/cfowlerdesign Upgrade your font library, design assets and textures with Design Cuts! Check out their latest bundle and potentially save $1000s! (LIMITED TIME OFFER) https://cfowler.design All of these links are affiliate based, so by checking out our sponsors you help to support this show and keep it going! Thank you! I really enjoyed this show with Brenden, he's been a big inspiration of mine for a long time and it was great to finally sit down and talk. Brenden shares stories of what it's like to work and live in a small town, his collective The Design Cypher and how to find a good balance between work and personal projects. Find Brenden and all his projects here: Brenden's Website Brenden on Instagram The Design Cypher Thank you for listening to this episode of The Fowler Hour! Don't forget to subscribe to the show and share it on twitter and instagram! Your support, tweets and mentions help us reach new listeners just like you! Tweet about the show by using #fowlerhour Tag me in your instagram stories @cfowlerdesign This show is supported in part by our awesome sponsors! Never stop learning! Get 2 FREE months of Skillshare and take your design skills to the next level! https://skl.sh/cfowlerdesign Upgrade your font library, design assets and textures with Design Cuts! Check out their latest bundle and potentially save $1000s! (LIMITED TIME OFFER) https://cfowler.design All of these links are affiliate based, so by checking out our sponsors you help to support this show and keep it going! Thank you! I sit down with Bless today and discuss his design process, forming an online community and overcoming the cultural and social challenges of starting and running your own business in India. Find Bless and all his projects here: Bless on Instagram Bless on Dribbble Thank you for listening to this episode of The Fowler Hour! Don't forget to subscribe to the show and share it on twitter and instagram! Your support, tweets and mentions help us reach new listeners just like you! Tweet about the show by using #fowlerhour Tag me in your instagram stories @cfowlerdesign This show is supported in part by our awesome sponsors! Never stop learning! Get 2 FREE months of Skillshare and take your design skills to the next level! https://skl.sh/cfowlerdesign Upgrade your font library, design assets and textures with Design Cuts! Check out their latest bundle and potentially save $1000s! (LIMITED TIME OFFER) https://cfowler.design All of these links are affiliate based, so by checking out our sponsors you help to support this show and keep it going! Thank you! Mindset, creativity, freelancing vs agency life and running your own events - all on today's episode. Matt Dawson has been a big inspiration of mine over the last year or so and it was a pleasure to sit down and understand more about the man behind @staygrayponyboy! Find Matt and all his projects here: Crop Con - April 18th-19th 2019! Live in Louisiana Matt On Instagram Ash Collective On Instagram Ash Collective Website Thank you for listening to this episode of The Fowler Hour! Don't forget to subscribe to the show and share it on twitter and instagram! Your support, tweets and mentions help us reach new listeners just like you! Tweet about the show by using #fowlerhour Tag me in your instagram stories @cfowlerdesign ~~~ This show is supported in part by our awesome sponsors! Never stop learning! Get 2 FREE months of Skillshare and take your design skills to the next level! https://skl.sh/cfowlerdesign Upgrade your font library, design assets and textures with Design Cuts! Check out their latest bundle and save over $1000! (LIMITED TIME OFFER) https://cfowler.design All of these links are affiliate based, so by checking out our sponsors you help to support this show and keep it going! Thank you! Laura Evans (Nifty Fox Creative) is a visual storyteller, graphic recorder and live scriber. She helps her clients think visually and explain complex ideas to their audiences through illustration and graphics. We dive deep into the importance of storytelling, networking and finding a niche on today's episode. Find Laura and her projects here: https://www.niftyfoxcreative.com/ Nifty Fox Creative Instagram Thank you for listening to this episode of The Fowler Hour! Don't forget to subscribe to the show and share it on twitter and instagram! Your support, tweets and mentions help us reach new listeners just like you! Tweet about the show by using #fowlerhour Tag me in your instagram stories @cfowlerdesign ~~~ This show is supported in part by our awesome sponsors! Never stop learning! Get 2 FREE months of Skillshare and take your design skills to the next level! https://skl.sh/cfowlerdesign Upgrade your font library, design assets and textures with Design Cuts! Check out their latest bundle and save over $1000! (LIMITED TIME OFFER) https://cfowler.design Interested in learning logo design? Logo Core's best selling masterclass teaches you the skills you need to kickstart your design career! http://bit.ly/logo-design-courses All of these links are affiliate based, so by checking out our sponsors you help to support this show and keep it going! Thank you! Lisa Jacobs has had quite the busy year. We met through Instagram when she was a freelance logo and brand designer, but since then she has moved to working in an marketing agency. Today we discuss a topic I'm often asked about - whether to be a freelancer, run your own business or go and join an agency at the start of your career. Lisa has all the details as we go in depth during this episode! Find Lisa and her projects here: Lisa on Instagram Lisa on Dribbble Thank you for listening to this episode of The Fowler Hour! Don't forget to subscribe to the show and share it with a friend if you enjoyed! Your support, tweets and mentions help us reach new listeners just like you! 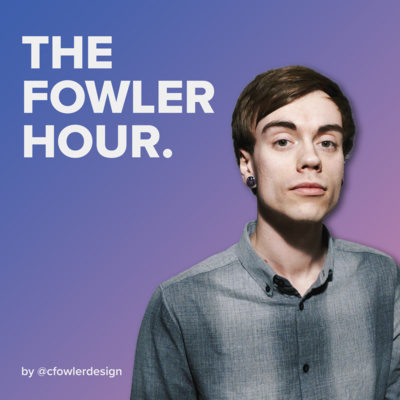 Tweet about the show by using #fowlerhour And follow me on all platforms @cfowlerdesign for more creative content! ~~~ This show is supported in part by our awesome sponsors! Never stop learning! Get 2 FREE months of Skillshare and take your design skills to the next level! https://skl.sh/cfowlerdesign Upgrade your font library, design assets and textures with Design Cuts! Check out their latest bundle and save over $1000! (LIMITED TIME OFFER) https://cfowler.design Interested in learning logo design? Logo Core's best selling masterclass teaches you the skills you need to kickstart your design career! http://bit.ly/logo-design-courses All of these links are affiliate based, so by checking out our sponsors you help to support this show and keep it going! Thank you! Mark Hirons is a graphic designer and prolific podcaster, with his show Creative Waffle racking up over 100 episodes with the guests such as, Aaron Draplin and Paula Scher. On today's show we discuss how podcasting has changed him as a person and some of the strangest stories he's heard from the most unassuming guests. A wild ride to say the least! 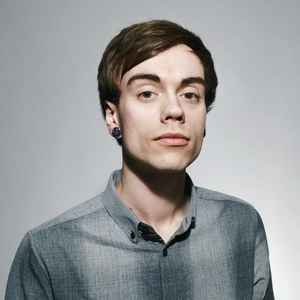 You can find Mark and his projects here: Creative Waffle LIVE in London! 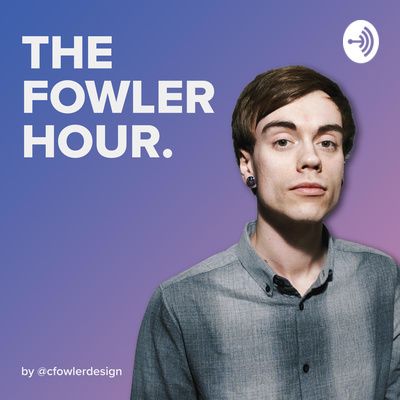 Creative Waffle Podcast Blue Deer Design Studio @bluedeerdesign Thank you for listening to this episode of The Fowler Hour! Don't forget to subscribe to the show and share it with a friend if you enjoyed! Your support, tweets and mentions help us reach new listeners just like you! Tweet about the show by using #fowlerhour And follow me on all platforms @cfowlerdesign for more creative content! ~~~ This show is supported in part by our awesome sponsors! Never stop learning! Get 2 FREE months of Skillshare and take your design skills to the next level! https://skl.sh/cfowlerdesign All of these links are affiliate based, so by checking out our sponsors you help to support this show and keep it going! Thank you!